When David Fincher’s film, “Zodiac,” based on the book by former Chronicle editorial cartoonist Robert Graysmith, opened in February 2007, the newspaper asked me to write about the mood inside the Chronicle during the reign of terror by the cryptic serial killer in the late 1960s and early 1970s. The film starred Jake Gyllenhaal as Graysmith, Robert Downey Jr. as my late former colleague and mentor Paul Avery and Mark Ruffalo as homicide detective David Toschi. This article appeared in the Sunday Datebook section February 25, 2007. That was the blunt denial on the dollar-pancake-sized buttons we had made up as a gag after the Zodiac serial killer threatened my friend and Chronicle colleague, reporter Paul Avery, with a Halloween card in October 1970. By that time, police had already linked Zodiac to at least five random, brutal murders dating back two years. He challenged police to catch him in boastful letters to The Chronicle and other Northern California newspapers, enclosing elaborate cryptograms and even scraps of one victim’s bloody shirt as proof of his deeds. Someone produced the buttons in short order, and we all wore them on our lapels. Chronicle columnist Herb Caen mentioned it in a funny item that brought TV news crews scrambling to our third-floor offices at 901 Mission St. Still, we had to wonder. If Zodiac was serious about whacking Avery, no silly buttons would throw him off, and he might just as easily take out one of us at the same time. Now, whenever I left the building with Paul, I couldn’t help being more keenly aware of our surroundings. I looked much more carefully around corners, behind us, in parked cars and into the eyes of passing strangers. Paul died in December 2000, at age 66, not at Zodiac’s hand but his own, succumbing to emphysema brought on by decades of smoking. I am sad that he didn’t live to see the feature film “Zodiac,” based on the book by former Chronicle editorial cartoonist Robert Graysmith, opening in theaters here and nationwide on Friday. Paul would love the idea that a notorious Hollywood star with the stature and reputation of Robert Downey Jr. is portraying him in a major motion picture. It can’t be a coincidence that both men’s roguish lifestyles tend to overshadow their considerable career triumphs. It’s truly inspired casting. Downey brings Avery back to life brilliantly, if sometimes a bit too realistically for comfort. Avery’s colleagues regarded him as a reporter of consummate skill, but he was not above a little skulduggery to beat a competitor to an exclusive or usurp someone else’s turf. Unsavory Avery was the not-so-affectionate sobriquet that reporter Charlie Howe hung on Paul for his investigative tactics. I worked with Avery on the Zodiac case at times, checking on phone tips or brainstorming about the ciphers over beers on his Sausalito houseboat. We spent days chasing blind leads, skulking around dark places and following potential suspects, hoping to inveigle handwriting samples from them. Later, after Paul’s growing struggles with alcohol and substance abuse led to his departure from The Chronicle, I took over the coverage. But Zodiac soon dropped out of sight, and precious little news occurred for three years until the last letter arrived in 1978. It’s sad, too, that neither Avery nor San Francisco homicide detectives Dave Toschi and Bill Armstrong, both now retired from the force, never caught the man who ultimately killed six people — but only one in San Francisco — and is believed to have claimed dozens more victims. Now, four decades after his first murder, Zodiac remains unidentified, at large or dead, and either way a mystery. “The case definitely took its toll on me, my health, my family,” Toschi told me in a brief conversation the other day, adding that he won’t be doing any other media interviews. “You’re the only one I will talk to,” he told me. Now 75 and working part time as a private investigator, Toschi is curious about the movie. “Of course I want to see it, but I don’t know what to expect, how I will feel,” he said. 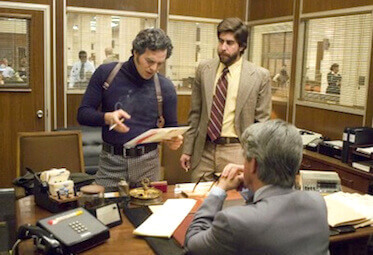 He should feel good about Mark Ruffalo’s strong and accurate portrayal of the David Toschi I remember well — the dedicated, detail-oriented cop with the gravelly voice, the sparkling eyes, the trademark bow ties, the plaid sport coats, his love of animal crackers — and his lament at never catching Zodiac. As big as the Zodiac story was, it came at the dawn of an extraordinary decade in the crime annals of Northern California, the first in a rapid-fire succession of major events that rocked the Bay Area between 1969 and 1979. The short list included the shocking Patty Hearst kidnapping, Hibernia bank robbery, Symbionese Liberation Army manhunt and L.A. shootout; the random Zebra murders on the streets of San Francisco; the San Rafael courthouse shootout and murder of Judge Harold Haley; the Golden Dragon restaurant massacre in Chinatown; the mass murder and suicides of more than 900 people — most from the Bay Area — in Jonestown, Guyana, and the killing there of local Rep. Leo Ryan and four others, including Examiner photographer Greg Robinson; the City Hall assassinations of Mayor George Moscone and Supervisor Harvey Milk; and the subsequent murder trial of Supervisor Dan White and its riotous aftermath. Hardened reporters, including combat veterans and others who had seen more than their share of human tragedy, marveled at the relentless magnitude of it all and wondered what else could possibly happen next. “It was a vivid time that marked us all,” another former Chronicle colleague, Jerry Carroll, reminded me recently. “It was all adrenaline … very draining.” You might say the newspaper reverted figuratively to the original name teenagers Charles and Michael de Young used when they founded it with a $20 gold piece in 1865 as the Daily Dramatic Chronicle. As I watched the film, the 1970s atmosphere returned powerfully for me. The Chronicle city room set created for “Zodiac” is masterfully done in its period detail, but far too quiet and tidy, lacking the disheveled desktops, scattered newspapers and notes, cigarette butts on the bare wood floor, shouts of “copy!” and the frenetic movement of people. Nor can you smell the cigarette and pipe smoke that rose up from every section and blended with the scents of strong coffee, printer’s ink, fresh newspapers, pencil shavings, gum erasers, the gooey mucilage in the paste pots and the oily odor of the bare dark wooden floor, producing an earthy and intoxicating aroma. A lot has changed through the evolution from manual Royal typewriters to IBM Selectrics in 1974 to word processors in 1980, film to digital photos, hot lead to cold type, and family ownership to mergers and corporate management. I moved on to a publicity career with the San Francisco Giants, then into PR consulting and corporate communications. But none of it has ever compared with the excitement of being in The Chronicle city room when news is breaking. No, I am not Avery, but I like to think we shared the same passion for a good story. Zodiac, now that was one hell of a good story.